Try Continuous Ink System with your Brother DCP-J315W and make 30 times more quality prints for the same money! Pay only 0.04 USD for A-4 full color print! Brother is another one multifunctional device, which tries to dazzle us with its wide set of functions. This printer has a stylish design and supports a lot of different connections, including cable and wireless networks, photo printing and has a convenient color dual-width LCD display and the possibility to connect CISS. Continuous ink supply system or ciss DCP-J315W is applied for continuous ink supplying from the donor tanks to MFD (multifunctional printing device) or the printing head of the printer via flexible loop to the block of cartridges of ink system or to the original cartridges of the printer. It depends significantly on the model of the printer. For starters, let's consider the efficiency of the printer, which is related to different parameters. 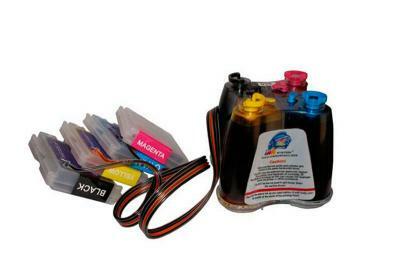 It depends not only on the speed of color printing, but also on the labor intensity as for technological operations concerning replacement of original cartridge or ink refilling, and also it depends on the percentage of bad copies, which you can get if the ink in the inner cartridges will over during printing. If you don't use continuous ink supply system ciss ink system brother DCP-J315W, then the ink in the standard cartridge will over and you will have to substitute it with a new one. You should remember that depending on the printer's model you will have to carry out different actions as for cleaning and adjustment of the device. It can take you not less than half an hour (or more, if suddenly a new original cartridge turned out to be damaged). You should also take into account, that there are several different cartridges in your printer (or one with several different cameras) with ink of different color and that this ink will not over at the same time. Accordingly, if you use several color cartridges, you will have to change them much more often, than the cartridges with separate ink reservoirs. If you use one color cartridge with several ink reservoirs, you will have to throw it out with unconsummated ink. That is why the average time of printing and above all the printing cost will grow significantly. Needless to say, that you can avoid all these difficulties if you use printer with continuous ink supply system CISS for DCP-J315W. It will allow you to increase the performance of your printing system along with the same equal conditions. Not only the printing speed, but also the productivity will increase greatly, because of the absence of necessity to waste additional time and money for cartridge replacement. CISS for brother DCP-J315W will do everything instead of you, as well as the similar models in this class ciss for brother MFC-J430W and ciss for brother DCP-J525W.